Samplitude Music Studio offers artists and musicians everything they need for comprehensive music production and for making creative ideas a reality - from composing and recording to mixing and mastering songs. And all at the highest level and in outstanding audio quality. Tons of professionally pre-produced sounds, loops and instruments and high-quality effects and tools are included within the program. With powerful 64-bit technology, multicore support and multi-track recording in 24-bit/96 kHz, Samplitude Music Studio enables users to accomplish even complex productions. Samplitude Music Studio - enables unlimited creativity! The new Samplitude Music Studio. With its impressive audio engine and endless creative options for improvising, composing and producing music, Samplitude Music Studio offers enormous flexibility. Whether you're working on a multi-track recording of your band in 24-bit/96 kHz, producing a remix or simply want to reformat into MP3 files, Samplitude makes it all possible. Experience true creative freedom. Samplitude Music Studio is your own virtual rehearsal space, where you take part in regular jams and session, and compose and record your own melodies on the piano or guitar. In addition, you can mix and master songs like a true audio professional. With high-quality sounds, loop and instruments in addition to 64-bit power and multicore support, Samplitude is sure to fulfil the desires of each and every musician. The new version contains even more virtual instruments and professional plug-in effects. It's a real comeback! There's also a range of impressive new features and a clean, modern interface in carbon style. Samplitude Music Studio celebrates its comeback with 3 brand new, impressive Vita instruments. With Orchestral Ensemble, compose orchestral music that will simply astound, while the Grand Piano lives up to its name with its warm, authentic piano sound. Vita Sansula offers kalimba sounds that are truly one-of-a-kind. With the inclusion of essentialFX Suite, Samplitude Music Studio offers even more creative options for a professional mix. This suite includes 11 high-quality plug-in effects for achieving impressive, crystal-clear results. Choose from a compressor, flanger, phaser, limiter, reverb or delay. With MIDI Velocity Dynamics in Samplitude Music Studio, take full control of velocity dynamics in your MIDI recordings - during the recording process, or afterwards. Adjust volume levels with total precision during the recording process, or later when editing your tracks. In the new version of Samplitude Music Studio you can load and work with up to 32 instruments within a single project simultaneously. There are more creative options than ever before, enabling you to bring your composition process to a whole new level. Are you a fan of indie rock, or more into producing your own hip-hop beats? Or maybe psychobilly grunge with EDM influences and hipster jazz melodies? Bring your creative ideas to life with the new Samplitude Music Studio and produce exactly the music you want. Play your own instruments and record vocals on up to 16 mono tracks or 8 stereo tracks simultaneously. Then, mix your tracks with the virtual mixer and use the professional mastering tools to create outstanding, full sound. Let your creativity run wild: Compose new melodies on the piano or guitar and record on up to 16 mono tracks or 8 stereo tracks simultaneously. Choose from thousands of pre-produced sounds and drum grooves to add more punch to your recordings. Samplitude Music Studio offers synths, drum machines, samples and a huge range of additional virtual instruments for one-of-a-kind music production. You're not looking for any old sound - you're looking for THE sound. And with Samplitude Music Studio, you're sure to find it. Professional filters, effects and mastering plug-ins are seamlessly integrated into the interface and are a cinch to use. Use the Stereo FX module, multiband compressor, 6-band equalizer, limiter, Multimax and even more features and create astounding audio results. Are you a full-blooded musician and need notes like you need air to breathe? In Samplitude Music Studio you can display, edit and then print notes for all your own tracks and compositions. This way, you're prepared in the best way possible for your next band rehearsal or jam. Instruments, sounds and loops in Samplitude Music Studio. The new version of Samplitude Music Studio offers a massive range of creative options for song composition. It contains a total of 22 impressive virtual instruments and 6 Soundpools with tons of professionally pre-produced sounds and loops. Percussion, electronic sets, complete rock drums, jazz drums and BeatBox 2 help you create the right groove for rehearsing, jamming or creating new music. Create catchy leads, cinematic sounds, abstract audio worlds, euphoric sequences, grating basslines and oscillating pads with Lead Synth, DN-e1, Revolta and Cinematic Synth. Compose impressive arrangements with female, male or mixed voice choir. The new virtual choir can be used in combination with the elegant Church Organ and Concert Grand to create stunning melodies. The fantastic range of folk instruments includes a banjo, steel guitar, folk piano and traditional bass sounds. Perfect for creating folk music, and great for producing great rock, dance and house tracks too. The virtual accordion adds a light, French sound to chilled out beats and traditional songs. It's the ideal instrument for making background music sound different and authentic. This sampler's got the groove. Easily drag & drop sounds from various audio files into the sampler and start developing a new idea. Cuts and pad assignments are made in the sampler automatically. The 6 Soundpools in Samplitude Music Studio pack a definite punch. There are sounds and loops for beats, bass, entire melodies and even for vocals and rap. And best of all, you can drag & drop to combine them any way you want. Whether metal, house, funk or somber film music - they all work in combination! 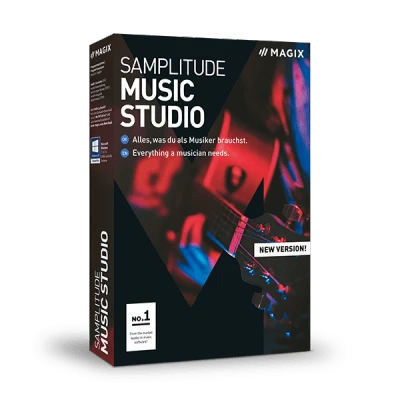 With helpful tools such as the Quickstart Wizard and the MAGIX Audio remote app, Samplitude Music Studio enables a faster, optimized workflow for music production. That's a promise! With the Quickstart Wizard, you're ready to jump right in. The Quickstart Wizard prepares everything for you to start recording, composing and improvising - all it takes is a single click. Want to start or stop a recording on your computer while you're in the sound booth or modify the sound of the instruments? With the MAGIX Audio Remote app, it's no problem. Simply download the free app and get started. Learn about essential functions in Samplitude Music Studio in no time at all and how to start creating music at the highest level of music production today - with our free online tutorial videos. The MAGIX tutorials are the best way to find out more about the world of MAGIX and our wide range of software programs.